would appreciate any advice on how to improve these lines? Zelda, someone has asked this question already --> LINK. I encourage you to do a search next time to save you time. Sarah does not recommend derma rolling around the eye area because there is a change you can prick the eye and the bone under the eye. Therefore, you must be careful and pull your the skin under the eye when you roll. The suggestion is the 0.25mm in length. The lines could just be your natural creases. You want to maintain a well-designed skin care regimen that can also help boost collagen production and smooth out those lines, but I have no guarantee the lines will diminish dramatically. A combination of 0.25mm derma rolling and that skin care regimen should help. Other than that, you may want to seek a plastic surgeon for that. You could try and apply Infadolan daily around your eyes. Some of our customers started to apply it there and their lines slightly diminished. We never excepted this would happen and we never recommended Infadolan for wrinkles. It was an unexpected "side effect" that was reported to us by several customers. Infadolan doesn't make wrinkles miraculously disappear (no cream does). It happens most likely because it is a super efficient and long lasting moisturizer and vit. A is useful for the skin as well. And as it is often the case with such remedies, it is not going to work for everybody. 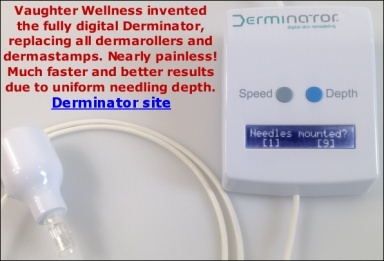 Dermarolling doesn't work for everyone either - but for most it does. Oh, sorry Zelda, I made an assumption that you were asking about the derma roller. I apologize. You should try out the Infadolan, then.